There are so many things to see in the Blue Mountains, its hard to decide what to do and where to go! For the best Blue Mountains outdoor canyoning and abseiling activities ‘River Deep, Mountain High’, we choose the premier local wilderness and adventure tour company – Blue Mountains Adventure Company. 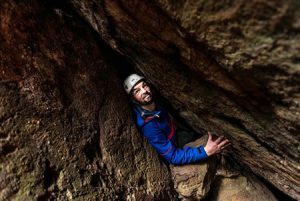 Based in Katoomba, they offer canyoning, abseiling, rock climbing, bush walking and mountain biking tours for individuals and groups of all ages and experience levels. BMAC employ only highly trained, safety conscious and professional guides who are qualified to take you into the wild! They love what they do, and want to share their passion for adventuring with you to show you the Blue Mountains in a unique and fun way. The Blue Mountains Adventure Company has a number of great tours. They will pick you up from our Hostel, supply all the gear and show you the best spots in the area. This full day tour is a classic introduction to the excitement of abseiling and canyoning in the Blue Mountains. We recommend this tour for anyone with a reasonable level of fitness and a thirst for adventure. In the morning our qualified guides will introduce you to the fundamentals of abseiling, starting with gentle 3m descents and working your way up to 25m cliffs. Develop your technique and gain confidence in your new skills in a beautiful bush setting. After a delicious picnic lunch, head to the action-packed Empress Falls Canyon and put your abseiling knowledge to good use. Its a downhill walk along a well-trodden path to get to the canyon. When you get to the start of the canyon you will jump off the tourist track, get changed into your wetsuit, helmet and harness and make your way through Empress. Enjoy jumping, scrambling, splashing, wading, whooping, swimming and sliding your way down the beautiful sandstone canyon, eroded by millions of years of rushing water. Marvel at the fluorescent ferns and towering cliffs as you move towards the exciting finale. Empress Canyon finishes with a thrilling 30m abseil down a waterfall. That’s bound to get the adrenaline pumping! Action-packed from the get-go, you will be impressed by Empress. Suitability: No prior abseiling or canyoning experience necessary. Low to Average fitness required. 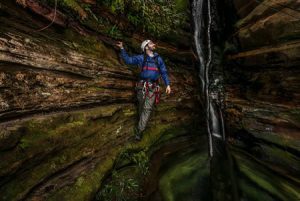 Step into the heart of the Blue Mountains World Heritage Area on this remote, full day canyoning tour. If you are after loads of summer fun, fantastic water jumps, slides and swimming without the technical demands of abseiling, Sheep Dip Rocky Creek will provide. Whether you are a first time canyoner, a seasoned veteran or visiting with your family, Sheep Dip Rocky Creek is a great day out. Sheep Dip and Rocky Creek are two canyons with two very different characters. After a scenic drive and a short walk you will find yourself in Sheep Dip canyon, a narrow twisting chasm with a chain of pretty pools, natural waterslides and lovely small waterfalls. Sheep Dip finishes with an exciting plunge into a unique, round hole. After the fun-filled action of Sheep Dip, take an easy walk through lush rainforest to the majestic Rocky Creek canyon. Be humbled by the awesome, timeless atmosphere of Rocky Creek, much deeper and darker than Sheep Dip. Several short, dark swims and down climbs bring you to a superb cascade. We ride it like a waterslide (which can be done face first!) before the canyon twists and turns past breathtaking rock walls to the finish. Suitability: This is a non-technical canyon. No prior abseiling or canyoning experience necessary. Average fitness required. Fortress canyon is a beautiful wilderness canyon which finishes with breathtaking views over the Grose Valley. The day starts with a walk through the Aussie bush and along a delightful walled-in creek. The landscape is ever-changing and you will pass unique, endangered hanging swamps and rare temperate rainforest. Then change into your wetsuit, helmet and harness and begin your canyon adventure. You will swim between narrow, towering sandstone cliffs, scramble over rocks, jump into deep, pure pools and take on an overhanging abseil (suitable for first-time abseilers). The canyon ends on the edge of a precipice, one hundred metres above the spectacular Grose Valley. Enjoy your lunch on a sun-soaked rock shelf (weather permitting!) and take in the awesome views. The first 20 minutes of the hour long walk out are the steepest so breathe deep, enjoy the fresh air and remember to stop and check out some of the best views in the Blue Mountains. Suitability: No prior abseiling or canyoning experience necessary. Good fitness required. For more information and to make a booking, please see reception.